This is the first post written on Digital Triggers that isn’t by our team. WE reached out to Adam White, after seeing one of his posts, and asked him if he wanted to do a guest post. With that being said, I’m excited for you guys to read this article by Adam White on how to build backlinks the RIGHT way, and get a new site to rank in just a few month! Enjoy! Because I have done so much backlink research for SEOJet, I often have people ask me how to safely and effectively build backlinks to a new site. I don’t think there is just one way to do this but I will share with you how I have done it and what has been successful for me in my own SEO efforts. Before I get into it I want to explain something about natural backlink profiles. When I speak about natural backlink profiles I am mostly talking about anchor text profiles (ie you can’t do a bunch of exact match anchor links without getting punished by Google). There are three major groups that all anchor text can fit into. Blended Anchors. These are links where the anchor text contains parts or all of your key phrase but also other words with it. For example, if your key phrase was “insurance quotes” then anchors in the Blended Anchors category would be something like “looking for insurance quotes for your car”. Essentially the key phrase is hidden in the anchor. Exact Match Anchors. In other words, “insurance quotes” would be your anchor text. Natural Anchors. Things like your brand, some form of your URL, or anchors like “this site” would fall into this category. I’m taking the time to explain these three categories to you because in order to keep a natural backlink profile you need to understand these three groups of anchor types. automatic boost in their rankings simply because they are so trusted as a big brand. This is why you will see pages on Amazon or Overstock.com ranking #1 without any links pointing to that certain page. So how do you build brand trust? You do what the brands have done. You get a lot of links that point to your homepage and the anchor text of those links needs to say one of the following: “Your Brandname”, “YourBrandname.com” or “http://www.yourbrandname.com”. In other words, these links should fall into the Natural Anchors category. Until you have at least 10-15 solid links pointing to your homepage I wouldn’t even bother linking to another page. You’re probably wondering if you should ever target key phrases on your homepage. With your on-page SEO you can target key phrases to your heart’s desire, but in your links, you should do very little of that. According to the backlink research we have done from #1 ranked pages this is what your homepage anchor text spread should look like. Image source: SEOJet dashboard. 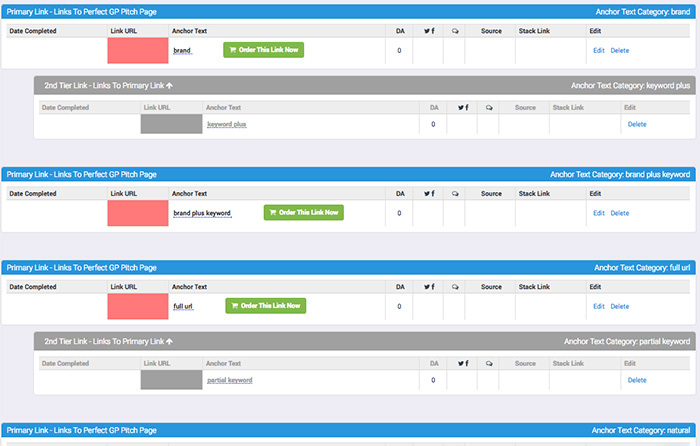 You can see three categories of anchor text we have talked about in the above snapshot of SEOJet’s dashboard. You’ll notice the software is guiding you to be in the blue ranges in each category where on your homepage around 90% of your links should fall in the Natural Anchors category. This is very important. You see that on non-homepage pages you can be more aggressive in targeting key phrases, but most of that comes in the Blended Anchors category, not Exact Match Anchors. It’s also important to note that you still need almost half of your backlinks to your power pages to be in the Natural Anchors category. How quickly can you build links to your power pages? As long as you are building links to your homepage and have started to gain brand trust you can build links to your power pages almost as quickly as you want. The main thing to think about is that you stay inside the proper anchor text ranges as shown in the above image. Also, I would suggest that you don’t go out an build a thousand links to a power page or any page of a new site. Let it be a slow gradual build up. As you build out links to your power pages you need to ensure that you maintain a natural looking backlink profile throughout the process. This means you should strive to keep your anchor text profile in the blue ranges as shown above. Having a link roadmap in place beforehand really helps keep you on track. Inside of SEOJet we build link maps that literally do just that, keep you in the blue ranges throughout the link building process. As you move in and out of the blue ranges the software shifts the links it is telling you to get to help get you back on track. You can also use a spreadsheet to create a roadmap and track it that way. Once you have started to establish your site as a brand and are starting to see some movement in the search results the next thing to do is to start building the value of each link pointing to your website. You do this by making sure you don’t have any orphaned links. In other words you don’t want pages linking to you that are just sitting out in cyberspace with no social signals, no comments, and no links pointing to that page. You want to show Google that the pages that link to you are active pages with real people using them. The first thing you can do is make sure there are some social signals pointing to the page where your link is. You can do this through a simple boosted FB post from your FB business page, or sharing it on Twitter and asking others to share it as well. You’d be surprised what a difference having good social signals can make for a page. Another signal to send to Google that a page is important is comments. This applies to blog posts only but most of your links should be guest post links. You can literally go to a place like Fiverr and pay someone to leave a comment on the posts that have a link to your site. But the biggest signal and probably the hardest for most people to swallow is building links to your links. Yes you read that right. You should build links to the pages that link to you. You do this for two reasons. First, a page with no links to it doesn’t really have much SEO power unless it is on a really powerful authority site. So by building links to the page, you can build the SEO value that gets passed on to you. Second, with Google, relevance is a huge ranking factor. By building links to the pages that link to you, you can really help create more relevance on those pages. You simply link to the page using keywords you are trying to rank for (but using Blended Anchors) and that builds the relevance of the page which then passes that on to your website. If you took the time to do these three things with every link you got, you would see results in Google much quicker than your competitors because they more than likely aren’t doing any of them. Inside of SEOJet, we have all of these features built in so you can keep track of what signals you have sent to each link. The hard truth is that you can never stop link building. If you want to get top rankings and then maintain them you need to continually build links to your homepage and also to the pages you most care about. I try to get at least one link to my power pages every 30-45 days but often I will do more than that. Then sometimes I will do less because I try to keep when I’m getting links as random as possible. I built SEOJet to help guide me through this process so that I wouldn’t neglect any pages that were important to me. You can see that on the site dashboard it tells me how many days have passed since I placed a link to a power page and if I have any links in progress. Because the homepage should be getting more links than any other page, I try to get one link to my homepage for every link I get to any other page although that is not a hard set rule. Again, throughout the life of your website you are trying to mimic a big brand so keep building Natural Anchor links to your homepage. What If I Already Have A Lot Of Links? The great thing about SEOJet is that it will look at what you have already done with backlinks and then give you a plan based on that. So whether you have a lot of links or are brand new it will tweak the link roadmap based on where you are. There you have it. If you follow these four simple steps you can take a brand new site and in just a few months have it ranking in Google. Questions or comments? Leave them in the comments section below. Learn more about their service, and skip the invitation only list! Adam White is the founder of SEOJet, backlink management software that helps marketers build amazing backlink profiles. In his spare time, he wrote and directed a feature film. He lives in Arizona with his wife and 6 children.